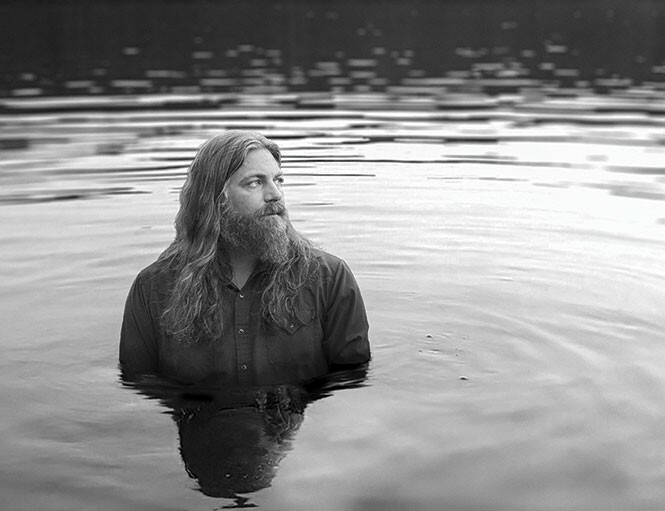 There's not much of a story behind Jake Smith's evocative stage name, The White Buffalo. As a struggling musician trying to stand out years ago, he picked the name out of a hat and stuck with it. But it's fitting nonetheless for a man whose basic physical attributes already sound like the beginning of a tall tale: bearded, gray-eyed with shoulder-length hair and a barrel chest. Smith's big, resonant body houses a tactile voice that ranges from smoky growl to tender entreaty, and it gives life to the many narratives in his songs. Lately, Smith's darker stories have gotten a lot of attention, after some of his songs were featured in the recently ended FX show Sons of Anarchy, a drama about the various sins of a California biker gang. His murky acoustic ballads weren't written for the show, but they found a comfortable home within its dark universe. But the soul of The White Buffalo is larger than that, and his newly released album Love and the Death of Damnation (Unison) shows that the characters within him are capable of much more than villainy, and that his songs can do much more than brood. "It's not really bigger," Smith says. "It's essentially the same people we used on the last album. It's just a matter of the songs, and how big the songs could get—how far we wanted to push them, really." Songs such as the rousing opener "Dark Days" or the celebratory love song "Home Is in Your Arms" get downright upbeat, which Smith admits didn't exactly come naturally. "I think there's a really good variety on this album that I haven't explored in the past," he says. "There are actually a couple of songs that are just good-time songs that don't go into this dark world that I always seem to drift off into." When writing the sweetly profane country ballad "Go the Distance," Smith says he had to make a conscious effort to avoid the darkness. "You can take songs in any direction you want to, and I started to go down that road," he says. "I was thinking, why don't I just keep it positive?" But Smith at his most sunny still doesn't make a "feel-good" record. "This [album] seems less serious, but more serious?" Smith says with a question mark in his voice. It is a difficult record to define concisely. There's enough humor to go with the pain and enough light to go with the dark, that it can be a lot of things at once. There's a spiritual clash as well, hinted at in the cover image of Smith standing chest-deep in water. He embodies characters who seek a baptismal redemption but aren't fully immersed just yet. "I like to play with the idea of God, of good and evil, the devil, and what motivates people to do bad things or ... to do good things," Smith says. The line between heaven and hell is thin in The White Buffalo's narratives. "Last Call to Heaven," finds lost souls in the perdition of a dive bar. But messy and imperfect people can also be a source of salvation. In the song "Where Is Your Savior," Smith sings: "She ain't in the heavens/ She ain't making you proud/ She wipes away your tears just like she always do/ You might not understand it, but it's all for you." "Maybe you don't need to be looking to the heavens for salvation," Smith says. "It's the people that actually affect your life on Earth that can actually guide you and help you, and there's salvation in that." Love has its own complications as well. The song "I Got You," a duet with singer Audra Mae, explores how love holds a couple captive despite—or maybe because of—dysfunction. Smith sings: "Every single thought inside my head/ Telling me that this old heart is dead/ But I ain't got no brains in my heart/ I got you." After a decade of recording, Smith has honed his ability to find the harmony in competing but complementary influences—not only in his lyrics, but in the music itself. Smith grew up in Huntington Beach, Calif., listening exclusively to the country music his parents loved. As a teenager, he dove headfirst into the punk rock of The Descendents and Bad Religion. It wasn't until he was 19 that he picked up his first guitar. After that, he found that writing his own songs came easily. "They kind of just spilled out of me," Smith says. "I never was really a writer or anything. I just started writing." Since then, Smith has carved out a niche for himself that isn't purely country and isn't purely DIY punk, but is, nonetheless, pure. "I really try to keep things as honest or as raw as possible," Smith says. "The idea that you're going to affect somebody else's mind, or affect how they feel, is the most important thing."